loggique creates magical scents to celebrate your spectacular event or space. Whether it is for a wedding, party or stunning venue - we create a memorable atmosphere for your guests. We work with you to create a scent which truly inspires. - shampoo, conditioner, hand wash, moisturiser and an assortment of cosmetic products all sourced with the highest ethical and non-toxic principles. You give us an idea of your dream scent and the effect you are wanting to create. We then produce 4 miniature votive candles for you to smell, light and live with. The potpourri smell (from the unlit wax) can differ substantially from the lit smell (the scent throw). In addition, the way the wax throws the scent differently according to the fragrance concentration. Allowing yourself time to light and live with the scents is a critical part of the process. We want you to be entirely comfortable with the scent and the candles we make for you. On-site here at Letheringham Lodge, we offer bespoke scent consultancy with scent and essential oil blending with over 20 base scents - 2 hour session £200. We are confident that this process will result in a scent which you feel best describes the atmosphere you wish to create. If this doesn’t happen at this very first stage, we can continue the search for you by repeating the process until you are entirely happy. We have over 12 scent suppliers and also have experience of complex blending to achieve different effects. In some cases, you may have in mind a very complex, rare or patented fragrance which needs to be expertly blended with specific chemical additives and/or a chemist specifically employed. Please allow a budget of at least £800 for a bespoke scent to be chemically made for you. Alternatively, if the scent you desire is reasonably standard e.g. lime, mandarin and basil or lavender, we can easily supply this scent and you can miss this stage completely! Your scent is delicately blended with the very best natural soya or rapeseed waxes on the market. It is then expertly wicked for the maximum scent throw and then hand-poured into the highest quality glass jar containers. All candles are supplied with 100% natural wax and allergen free bespoke scent, packaged in cellophane with a ribbon. They come with the legal certificates of conformity to safety standards and have warning stickers on the base. Please allow extra funds for postage if you are not collecting them. If you are wanting to include hand painting, a logo or a design, please allow another £0.50 per candle to allow that personal touch. We use a number of the very best suppliers in the market and purchase wholesale so often the candles we make for you are as cost-effective as going you direct to these suppliers. In addition, if you order in quantity, we have found time and time again that we are able to meet even the tightest of budgets. If you would like to come to the logge (letheringhamlodge.com) and make the candles on site with us, we would be delighted to show you the full process and guide you through the best techniques. If you would like us to provide an ongoing service: we will store the recipe for your scent on file and be able to create candles, soap, diffuser blends or room sprays on demand when you need them. As with all our work, it is totally bespoke so the way the soap is made, packaged and scented will heavily depend on your needs and aspirations. Our simplest and most popular offering is a 100gm bar of white SLS and SLES free soap with your scent blended within in. This is packed in cellophane with an ingredients (required by law) and branding label and your branding and is priced at £2 per bar. 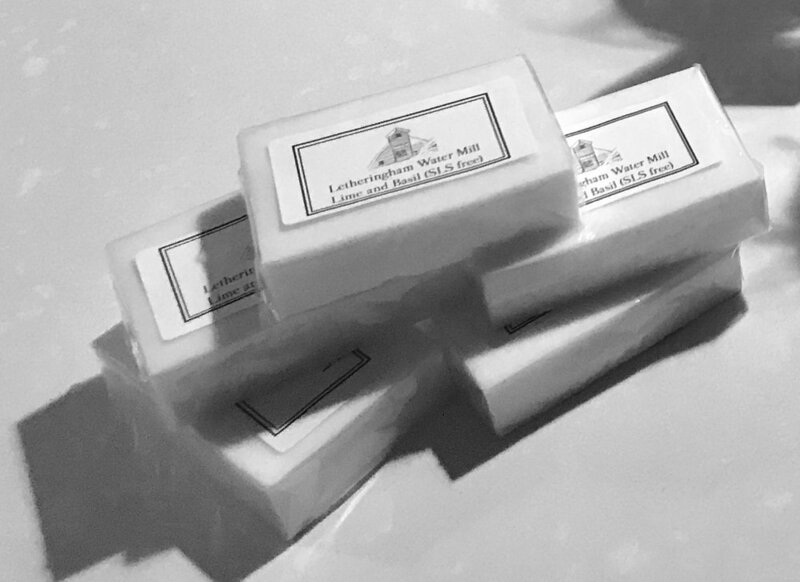 Our most complex soap offering is hand-stamped with your own logo/image/name, combined with a soap dish and packaged in a bespoke box. At this level, a budget of £18 per soap is realistic. We can supply your bespoke, personalised scent in glass amber bottles with cellophane and ribbon. We source the very purest essential oils; buying organic if the quality is higher. We also buy in quantity and therefore pass the savings onto you but essential oils are extremely concentrated and therefore the highest cost scent ingredient. If you would like to meet to discuss your needs without any obligation, please just call on 07545 127 264 and we can arrange a time and date to suit you. Alternatively simply email us@loggique.com and we can start finding the scent you have been dreaming of.